From previously sent or received mail attachments. Click below the text box. Select the files you want on your PC and then click Open. Attention. If you cannot attach several files at the same time, make sure you have the latest Adobe Flash Player version installed. For more details, see I can't attach a file. If you have accidentally attached the wrong file, simply click Delete. Note. If the size of attachments exceeds 25 MB, files will be automatically uploaded to your Yandex.Disk (Mail attachments → Sent as links to Disk). Select a file or folder and then click Attach. The recipient will receive a message with links to download the attachments. The download links to the attachments will only be available to users who participate in the conversation. Note. The maximum file size uploaded to Disk is 10 GB. The number of attachments is not limited. Many mail services reject attachments over 10 MB. 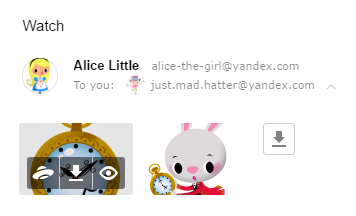 If you are not sure that your recipient can receive such an attachment, send it in parts (in several messages) or add the required files to your message through Yandex.Disk. All files that you sent or received are saved to your Yandex.Disk in the Mail attachments folder. Select the required file and click Attach. To exit view mode, click in the upper right corner, or press Esc. Update the page by clicking Ctrl+F5 and try to attach the file again. If the problem persists, clear your browser cache and delete all cookies before trying again. Make sure that you have the latest version of Adobe Flash Player installed. Open the page for downloading the module. If the version on your computer differs from the latest one, you will see the button Install now in the right part of the page. Click it to update the module. Disable any proxy server that you are using.